MediaMaster doesn't tell you what to listen to. Instead, you're in control. Unlike sites like Pandora or Last.fm that recommend music to you, MediaMaster lets you play songs on demand. The service lets you store your personal music collection online and allows you to share it with anyone you like. This is a step up from services that require you to keep your computer on all the time. It also means you can create custom playlists that can be embedded on your MySpace or Facebook profile for your friends to listen to, for instance. While the service is in beta, you can upload as much music as you like for free. 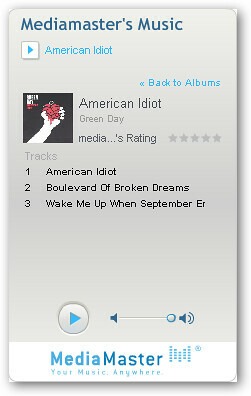 Digital music formats that are supported include non-DRM'ed MP3, AAC (M4A), and WMA files. The playlist widget may be the weakest part of the "you're in control" marketing message. It's intended to be an Internet radio station, which is code for you can't skip around and play songs from anywhere in the playlist. Once you pick a song to start with, the widget just cycles through the list without stopping. Competing services like Avvenu Player are more limited, only allowing you to store 250 songs online.